Announced in conjunction with Google's 19th birthday surprise spinner doodle, the digital game can be played on both desktop and mobile. 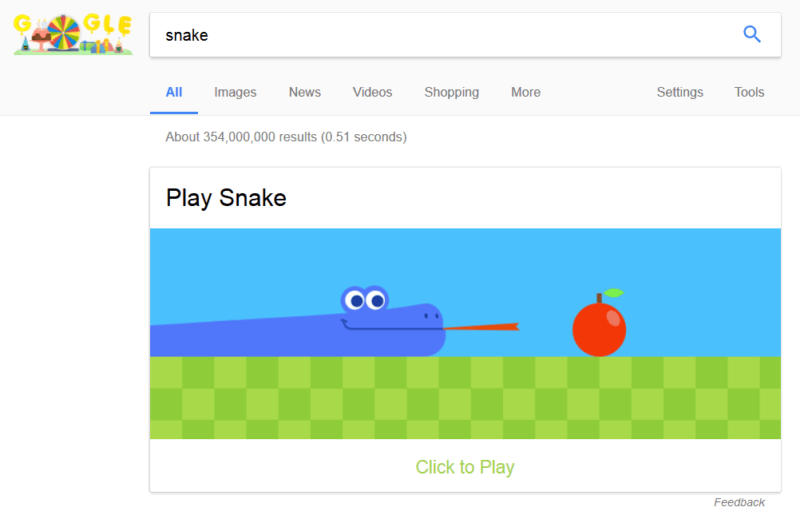 Searches for “snake,” “play snake,” “snake game” and “snake video game” all result in a “Play Snake” card showing at the top of search results. Clicking the “Click to Play” link launches a video game on both desktop and mobile where players navigate a snake around a screen to eat an apple. The snake game concept of maneuvering a line around a screen is long-lived, originally used in the arcade game Blockade in 1976. The game has had many variations throughout the years before making it to Google’s search page, showing up preloaded on Nokia phones as early as 1998.